Mexican silver is marked using a variety of symbols and initials. Depending on the age of each piece, there may be a hallmark, usually an Eagle or simply the word MEXICO, to denote the country of origin. In most cases, initials or pictorial symbols are makers' marks or are associated with a specific designer, artisan or studio (taller). Some fine retailers, especially high-end jewelers, often required that items sold on their premises are also marked with their shop's logo. Most Mexican silver marks are well documented and some of the most famous makers are popular with collectors, particularly artisan silver from the 1950s - 1980s when wealthy American travelers began discovering this country's beauty and flocked by the thousands admiring and consuming Mexican silver for its distinct and culturally inspired designs. In turn, this created a rapid proliferation of local and expat silversmiths & designers to a point that, unless you can specifically recall or know where/when a piece was originally purchased, deciphering Mexican silver or jewelry marks can be a daunting experience. The key to identifying Mexican silver is to begin by first estimating its age. Hallmarks, that denote the country of origin and which however were not strictly enforced in Mexico, can often indicate the general period of when a piece was made as these were revised over the years, most notably around 1940s and then again in the 1970s. The actual designer and/or maker's marks are then within a more limited scope of signatures and initials and should be easier to identify. The only exception is for artisans who did not register their marks officially or were not as prolific to be documented. In such a case, the age and style of a piece should be sufficient to describe it and appraise its current market value. Certain regions of Mexico attracted hundreds of very skilled artisans, especially around 1950s, who established their studios and created magnificent works that are now valuable collectibles appraised in the thousands of dollars. Most prolific areas include Taxco and of course Mexico City. Taxco silver is usually marked with this area's name, but not always. In contrast, Taxco marks should not be taken for granted as some artisans from other regions used related symbols, perhaps with the intention to sell their wares in that area, but are nevertheless not authentic as to their origin. As most experienced collectors of Mexican jewelry know, many signatures of very prominent silversmiths & jewelers have been faked and copied profusely, particularly since the 1990s. Serious collectors should always consult reference guides to identify silver marks. 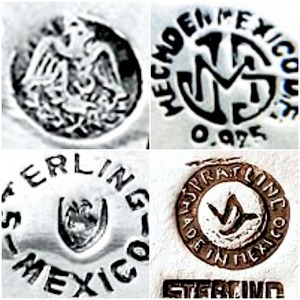 You can check out our extensive database to help you identify marks from Mexico and other countries on our Silver & Jewelry marks reference guide - marks4silver - and have unlimited access to the most comprehensive and updated list of worldwide marks & hallmarks. Our specialists can also answer your questions for free when trying to identify your silver or precious metals and even pewter from any country and period (members only). In addition to pages for marks & hallmarks, our research tools also include a price guide to help you evaluate your collection and be certain that you are not paying high when buying or asking too low when selling. Below are a few examples. An Art Nouveau Mexican silver bracelet, circa 1910, 9 cm long. A Mexican silver ring set with lapis lazuli.